Learn about critical sales steps and how they directly increase self-storage rentals, as well as how to assemble a lead-generation program to immediately improve occupancy. 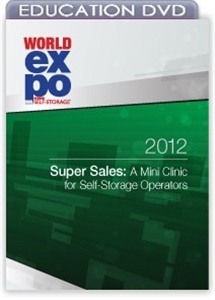 In today's self-storage environment, you must position yourself to operate with a sales and retail mentality. In this special 90-minute session, you’ll learn sales techniques to take your profitability to a higher level. Our presenter teaches you critical sales steps and how they directly increase rentals, as well as how to assemble a lead-generation program to immediately improve occupancy. This product is also available as on-demand video.